We took a little break but are back with more Phone-A-Friending! Ya-hoo! This one comes from, Julie, a New Yorker with a great apartment and her own Etsy site (Blythe blogged about it here). She even has a cat named Atticus. So yes, she is our favorite. I've got a kitchen dilemma. After years of feeling satisfied with my surroundings, I am on a big home improvement and redecorating kick. 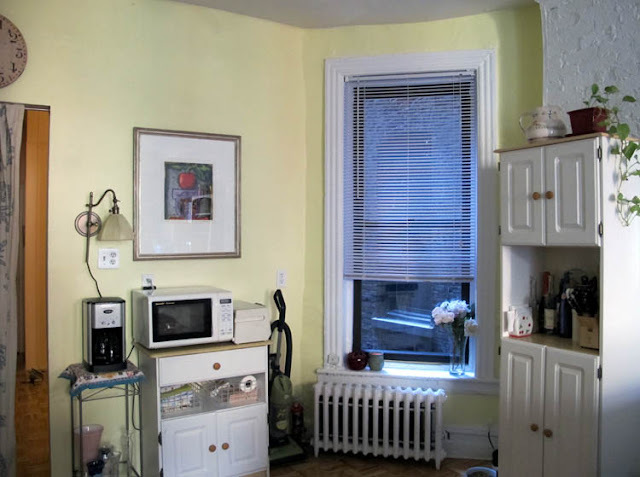 I finally painted my kitchen a sunny yellow, but have some other issues to work out: first and foremost, window treatments. This window formerly sported a long curtain, but I don't like the curtain solution anymore. It's currently wearing nothing but a cheap-o, standard issue white blinds. And I hate cheap-o, standard issue white blinds. Hate. So, what to do? A roman shade? Fancier blinds? Simple white? Color? Pattern? Ack, I just don't know! You'll see from the photos that the kitchen is wide open to the living room, so that's a visual consideration. Also, the hubby and I are planning on buying a lovely stainless steel trash can (feel free to disagree), and would love to replace the wall-mounted light (ugh, I hate it too!). Basically, we're open to upgrading, ditching, and replacing across the board when it comes to the kitchen. And here's a pretty important detail: this grad student is working on a majorly limited budget! Curtains: Since this is your main question, we'll spend the most time here. We suggest you buy or make a roman shade for your window. They are off the ground which is good for a kitchen and just casual enough. Deweese made one recently and you can read all about it here. 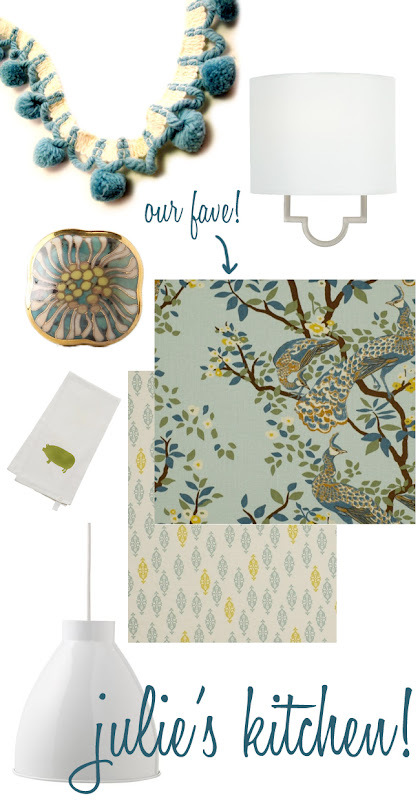 For the fabric, we suggest a bold pattern--something to pull those two solid colors together (the yellow and blue). To compliment this bold pattern, what about a complimentary pattern in the doorway, too? Two patterns can coexist beautifully if they are the same colors but completely different scales. At the risk of putting a bird on it, we are way into the peacock, but here is a less expensive option. And how about some vintage pompom trim? Also, check it out: this Etsy seller makes custom roman shades in dwell fabrics for $150! Might be a lot for a curtain, but we think it could have major impact! What about changing the knobs on the white and wood furniture to help tie things together? 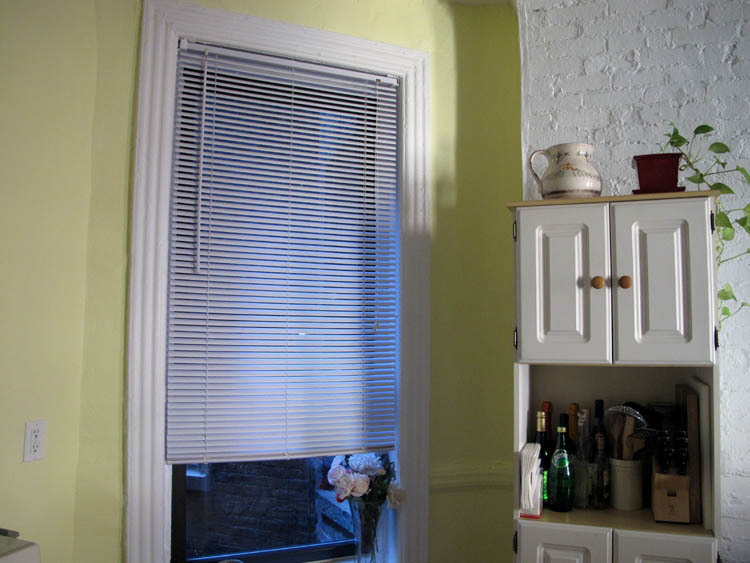 Have you thought about painting the inside of your pantry yellow, too? Could keep the kitchen as a whole very streamlined and less broken up. Lamps. We love a quatrefoil look these days, but there here is a less expensive option that also has clean lines. What about replacing your ceiling light? We'd love to see something sleek up there to update the room and subtly contrast that white brick wall. To avoid being overly matchy with the yellow/blue combo, you can incorporate all the colors in your patterned curtain, here we pulled the green out in this lil' piggy dishtowel. I have been coveting the Peacock Citrine Duvet Set forever, it just will not go on sale! I’m excited to know there are less expensive options.